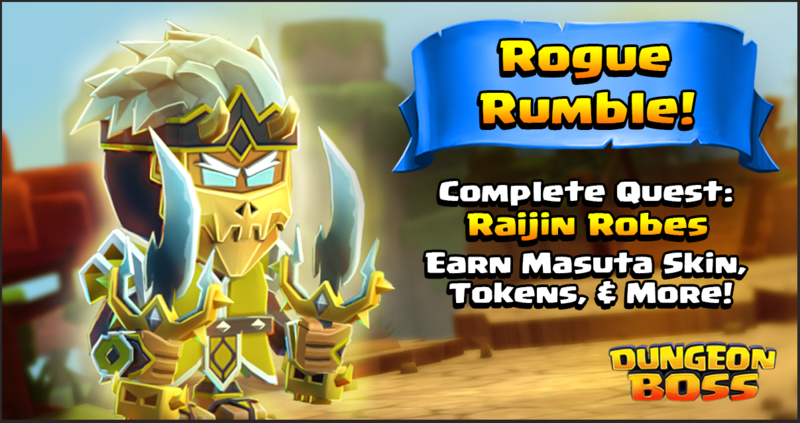 Ready for the Rogue Rumble! The Rogues are ready to go! We've got lots of quests for you to complete, including a quest chain that will allow you to unlock the Raijin Masuta Kira skin (or 3 Heroic Summons). Rogues with skins also get extra energy in dungeons. New quests will be added every day, don't let anything sneak past you! extra...... hope its 1 because i do NOT need shades using spirit link first round (edit) Shade isnt a rouge? I didnt know that. i thought he was a dark rouge spirit. my bad. As far as I know, there is no skin for Shade.... and he's a Caster, not a rogue..
What happens if shade possesses a rogue with a skin. Does he get +1 energy upon possession? These events offer little for end-game players. I have the "new" skin, I don't need the tokens and the ONLY worthwhile items in the event shop are materials. These events are great for the majority of players but please add items to the shop for end-gamers: a superior rune, corrupted hearts, exclusive skins. Give me a reason to play. Been saying that for months. We gave up all the new content in exchange for guild boss invasion that consisted of a brand new system capable of spamming your guild with in game mail. Other than that, just reused maps and models. The challenge was fun, but was hardly real content. These are sorely needed for players like myself. I've been 70 for a bit now, not a long time, but those tickets are a great way to get tokens for heroes I'm still working on and a HUGE relief in terms of materials. I'm desperate for mushrooms, silver, pyre embers, and fire crystals... and events like this are the one of the best ways to replenish my barren stocks. I like them, and hope they keep them coming. We had MK's skin in an event not very long ago, why not Shadowblade's skin this time? He's a Rogue too. Anyone else notice the event shop prices gone up as well? 12,500 (10,000 before) for tomes, 3,000 for crystals (2,500 before). Lame. Or give these events some real PvP implications for end game players. Instead of hundreds of matches of the same boring PvP against the same few boring meta heroes each week, use these events as a way to totally flip things around for a week at a time. I'm not talking the lame, nearly irrelevant event buffs we always see. Make the event buffs game changing. Could be really interesting. Caster event? All casters start PvP with an invuln shield for the week. Rogue event? All rogues inflict a random debuff on hit (normal or special) for the week. Tank event? All tanks have max dodge for the week. You'd keep things interesting for PvPers, force continual shifting and experimentation of rune and team setups, make PvP far more about planning and skill than time expenditure, introduce tons of variety compared to the stale-for-months-at-a-time meta, and all without having to spend the dev time to actually balance heroes constantly. I hadn’t checked out the shop til I read your post — good point, I’m wondering why the switch to inflated ticket priced items - are we expecte to earn more at this event ? What event and what repeatable? I must've not got the memo that there was a loophole. Forgot which event it was associated for , think elven rune war, r here was a repeatable for upgrading runes, people saw how awesome it was and really capitalizes on it , scoring many event tickets to buy everything and shop and still have chunks to dump on materials. They then dbjgb and changed it to repeatable 10x only . But for some folks who were lucky , it was still infinitely repeatable despite saying 10x so they banked and banked on materials . For events like this I'd actually prefer the choice for the skin quest. The MK skin is one I don't have, but not one I actually particularly like lol - I would rather have had the summons!! I mean it's fine, I still completed the quest and got the skin but would have preferred the summons. I like when skins are optional to purchase with the tickets, but that's just me! Once you've gotten the skin, next time you'll have that "choice". @hadouryu by "awhile" do you mean a month? If you're in a 210/240 guild the summons are meh. I think you guys need to take another look at how you are setting up the even shop ticket pricing structure. I did a quick calculation of how many max event tickets you can get this event and I'm coming to about 135,500 (Assuming 12K from non-repeatables per day x4 days for 48,000, and 87,500 from limited repeatables). Looking at the shop, not only did you guys increase prices across the board, but the most expensive item (that I can see) are superior rune materials, going for 25,000 tickets with a limit of 10. Why are you guys even offering a limit of 10 when it is literally impossible to get 250,000 event tickets? I get that the event a few months ago we were able to take advantage of the shop to a degree, but seems like you guys went above and beyond trying to limit us on what we can get in the shop. Either give us a means to get unlimited event tickets (obviously through a fair means, not just upgrading greater runes like last time), or reduce shop prices so that we can actually buy up to the limit. There is a way to get unlimited tickets using the ticket purchases (ticket+gems package, etc.) in the event shop. However, no one should or will ever do this as it is an extreme waste of money. The last repeatable (tuning) requires so many gems, I don't think I'd include it in my estimate of "available" points. For me, it would cost more in gems than the tickets I would get. Thats why we don't do that one often, of course sometimes we would do it by accident. I 2nd the aether idea. Would love to star up Aria before I die of old age.